Here are updates on two of the Florilegium Program’s botanical art projects. The Florilegium now includes 80 works of botanical art, representing 74 species, by 15 artists. Anyone unfamiliar with the digital Florilegium or florilegia in general can read about the project in the October 2014 Desert Breeze. Individual works in the Florilegium can be selected for viewing from a Browse page. Each work has a dedicated page with a zoom function for viewing the intricate details of the plants portrayed in the art. For the scientific botanical illustrations in the collection, annotations are provided next to the artwork to describe the plant structures represented in the drawings. Additionally, brief biographies are presented for the artists. 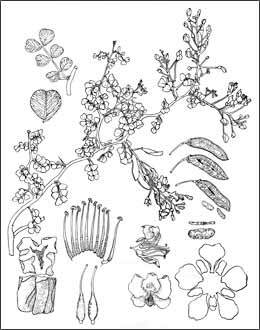 Included in the 80 works accepted into the Florilegium are 23 botanical illustrations that were prepared for Legumes of Arizona: An Illustrated Flora and Reference , the eagerly anticipated publication by the University of Arizona’s Desert Legume Program. The book is expected to be published in 2018. It will include nearly 120 botanical illustrations by 30 artists from the Tucson, Phoenix, and Denver areas. Known commonly as brazilwood, this small, densely-branched tree ranges from Venezuela and Columbia north to Sonora and Baja. When in bloom, the tree is a mass of color—gray-green bark, clusters of bright yellow flowers, and young seed pods of a striking copper color. As the tree grows, it develops a beautiful, deeply fluted trunk. At the center of that trunk is the dark red heartwood. (See the lower left corner of Margaret’s drawing for an illustration of the trunk’s fluting and heartwood). A vivid red solution that results from soaking pieces of the heartwood has been used traditionally as a dye for fabrics. 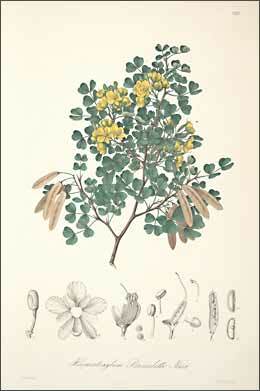 Brazilwood has also been used medicinally for treating a wide range of ailments. This article appeared in the February 2018 issue of The Desert Breeze, the monthly newsletter of the Tucson Cactus and Succulent Society.